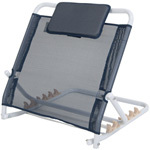 This stylish folding cane seat by Drive Medical provides you with a sturdy support cane when closed and a comfortable seat to rest on when open. Seat to floor height is 20 inches. With strong aluminum construction and a tri-pod design with vinyl contoured tipped legs, the cane seat weighs just 1.3 lbs. but can withstand a weight capacity of 250 lbs. Drive Medical strongly recommends this cane for users on the go, as this product is great for travel. The product is protected by a limited lifetime warranty.